Wellington, FL (September 21, 2011) – Colombian dressage rider Marco Bernal, who is headed to the Pan American Games in Mexico in October to compete for his native country on his Westphalian stallion Farewell IV, earned the Premier Equestrian Sportsmanship Award at the Wellington Classic Dressage Fall Challenge I Show. Thanks to his positive attitude and never-ending smile, just a few examples of Bernal’s good sportsmanship, the highly decorated dressage rider rode away with a new pair of German-designed Roeckl gloves from Premier Equestrian. 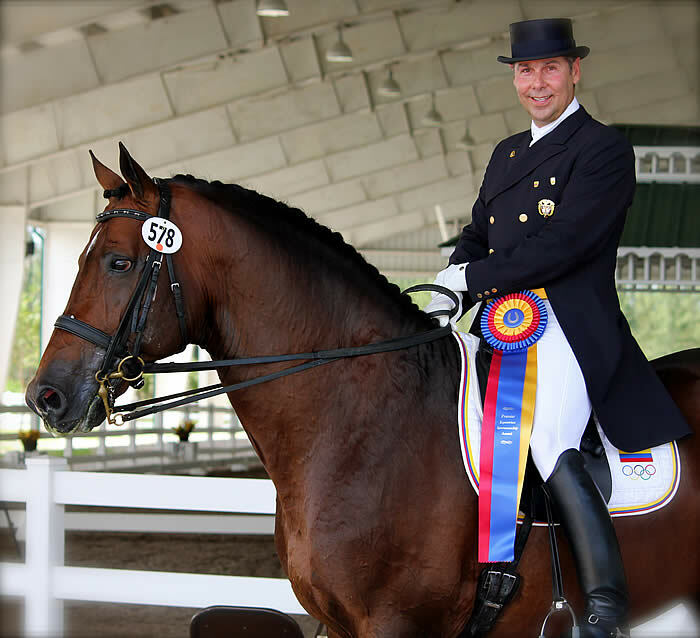 Bernal, who owns Marco Bernal International Dressage in Wellington, said he is looking forward to competing in Mexico. This will be the fifth time for Bernal to represent his country in the Pan Am Games. In 1999, the accomplished rider won a Silver medal at the Pan Am Games. He has also represented Colombia at the 2009 Rolex FEI World Cup in Las Vegas, competed in 2010 in the World Equestrian Games for Colombia and in 2010 competed in the Central American and Caribbean Games in Puerto Rico aboard Farewell, winning both the team Gold and the Individual Gold Medal.